Dave Hitchings is English born, Hartford located music and tech blogger and web developer. You can follow him on Twitter at @davehitchings. 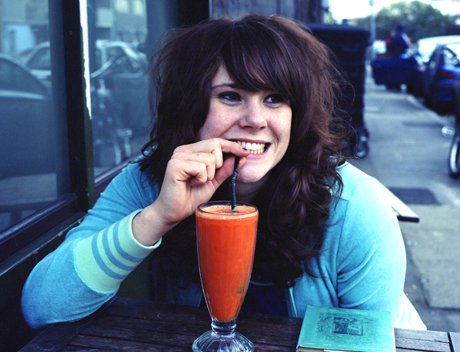 Last week London based singer Kate Nash released her second album, “My Best Friend Is You,” a follow up to her popular first album “Made of Bricks.” Nash, who was just 20 when she released her first album, has found an audience in her particular style of music. Though Kate Nash’s music sounds, to the casual observer, like a Lily Allen rip off, it has a lot more thought and depth than anything of her counterparts. The song begins like something similar to some seventies song about surfing. Then Nash’s unique voice cuts in. Piano at her side, Nash is in her prime as she sings the verse. Then, almost as characteristically as her voice, she breaks out into the chorus with a hook that you can’t help but get stuck in you’re head. Horns come in and it all builds, before coming to a head with everything together in one jubilant mix. Despite the sheer happiness, this song seems to bleed, the song is actually fairly cynical–a testament to the awesome song writing ability of Kate Nash. Dave Hitchings Wherever I go music goes with me, and I’ve gone far. From England to America, and a quick stop in Australia, the places I’ve lived have inspired and changed me. Each one has left their individual musical imprint. The vast difference between these musical cultures leaves me open-minded and willing. #musicmonday: Katy Perry – "Teenage Dreams"